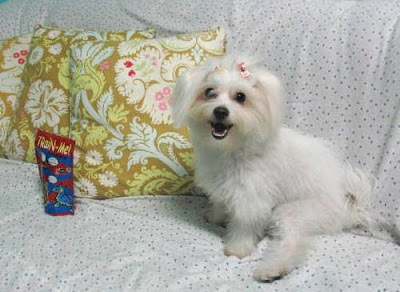 It's time for you to meet my one year old baby - the adorable little Frizzy; Izzy for short. Isn't she adorable? 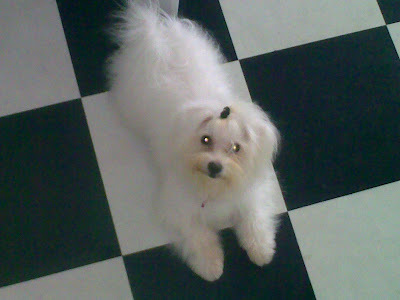 She looks like a stuffed toy! Then they told me Liebi had sisters and a brother. I just had to go and check them out. There were three puppies when we visited, one boy and two girls. This tiny little thing with her curly tail caught my heart. She was the liveliest of the bunch, not afraid to come out of her carrier and play with Liebi while the others cowered at the sight of strangers. A few days after, I took her home - thanks to Marco, who bought her for me as a gift for my 24th birthday. Izzy is super active. She likes to wrestle. The only time she's not hyper is when she's asleep. Lol. But when she's sleepy, she mellows down and wants to cuddle. Sometimes I think she doesn't know she's a dog. She stands everytime she wants something (like her toys on the table, or when she wants to be carried, or when she wants to be let out of the room). 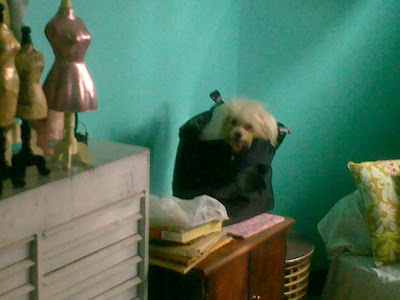 She asks for her bag when she sees I'm getting dressed - stands and tries to drag the bag out from wherever it's hidden. She's super funny too. She likes to sleep in the weirdest position: on her back with her head bent towards her tummy. I should probably take a photo next time. She goes crazy when she sees me preparing my blanket before I go to sleep - she'd run under it and just stay there until it covers her. She then playfully bites me from under the covers. 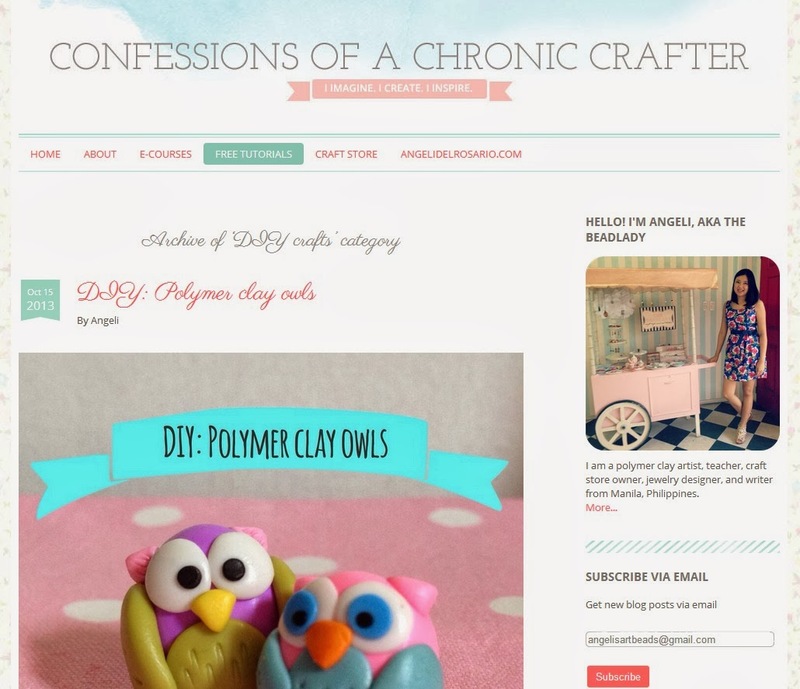 Your reading assignment: Craft, Inc. I'm launching a new line in a few days, so it's pretty crazy around here! All the non-crafty details are driving me nuts: pricing, minimums, lead time, wholesale discounts, and other boring stuff. And because I vowed to go completely DIY, I'm also in-charge of all the non-crafty-but-still-artsy little things like designing the logo, taking photos of the pieces, etcetera, etcetera. Good thing I bought this really handy book a few months ago. I've been dying to write about it for weeks now, but I just didn't know how to start. Well, looks like I found the perfect time to blog about it. Now, why do I still need a start-up guide when I've been selling my work for almost 7 years now? Believe me, if I had this guide back when I started selling, I'd be rich by now. Haha, not really. But there are so many things I failed to consider when I was starting out, that it's best to take a refresher course. 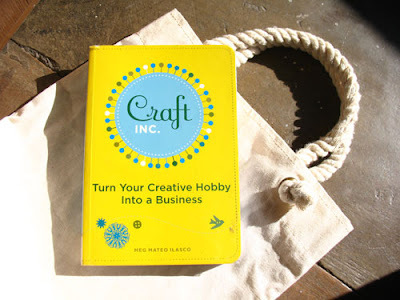 And Craft, Inc: Turn Your Creative Hobby Into A Business written by Meg Mateo-Ilasco is just what I need. It's God's gift to us crafters attempting to be entrepreneurs. The key word is attempting. Lol. If you're like me, whose right brain is far more assertive than her left, then you probably have trouble keeping the business side of things in check. This is where the book comes in. It's chock-full of really useful information that actually talks to your right brain - not the usual jargon-y stuff you find in most business books (and believe me, I'm a bookworm/hoarder and I've read my share of business books). 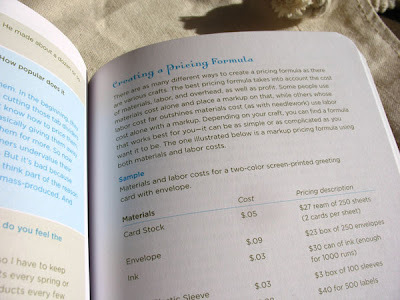 Take for instance the chapter on pricing your work. The most common question I often get in my workshops is: how do you price your work so that you are not over-charging customers yet not under-pricing your time and effort? Over the years, I have come up with my own formula, and I cannot stress enough how important it is that you not sell yourself short. This book explains the factors you need to consider, and goes a step further by providing sample computations. 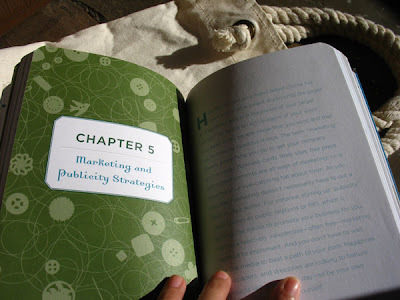 Must-reads are the chapters on how to grow your brand, and the marketing and publicity strategies that go with it. There's also a chapter on how to deal with being knocked-off. Winkwink! My favorite parts are the short interviews and profiles peppered all over - it gives you a sneak peek into the world of big-shots like Jonathan Adler and Lotta Anderson, and inspires you to conquer the world. Hehe. Do yourself a favor. Read the book. 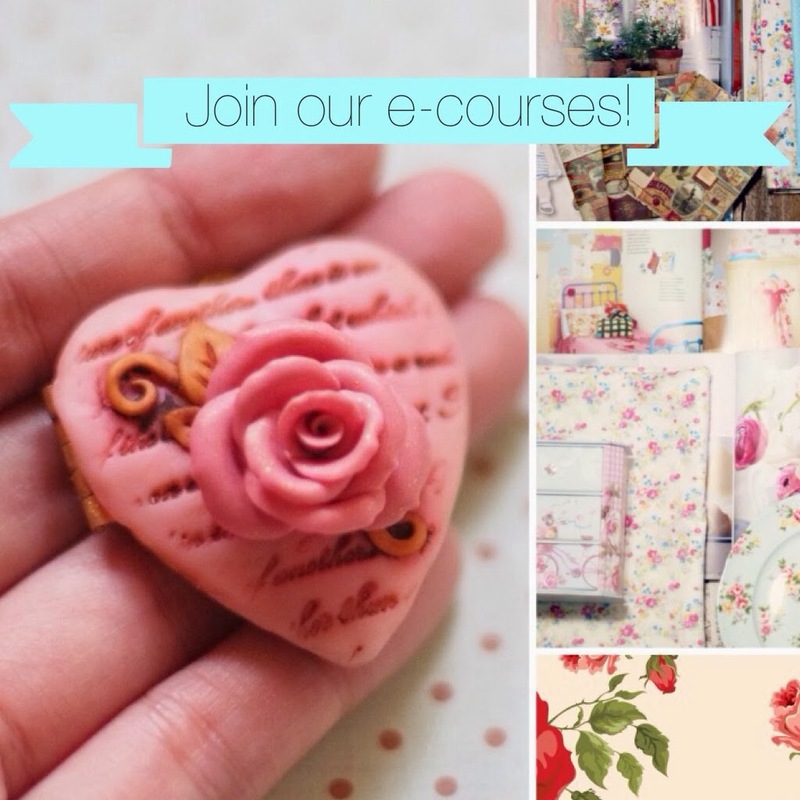 On March 1, visit this blog again to find out what I've been working on. It's not much yet, but I hope it will turn out okay. 2. I am waiting for a big magazine to hit the newsstands. I wonder when the new issue will be released. Crossing my fingers and toes. I've been waiting for almost 6 months! 3. My new stocks will finally arrive! Super duper excited. 4. This is the tricky part: I am launching a new brand! 5. Alice in Wonderland! I almost forgot! Showing March 5 - but not sure if it will be screened on the same date here. I am definitely excited for this! Been waiting for months! Wow, just seeing everything all typed up like that makes me want to hurl. Kabado. Excited. Takot. At the rate my heart's going, I might not make it till March! So there. Just sharing because it's the only way I can keep my sanity. I am having an awesome weekend! 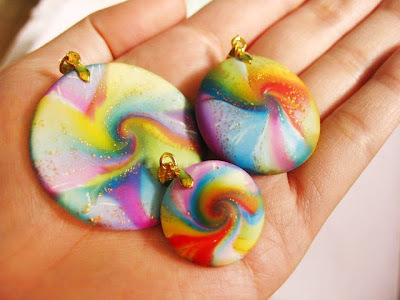 First off, my Hearts A-flurry pendants were featured on Polymer Clay Daily! I'm so happy! 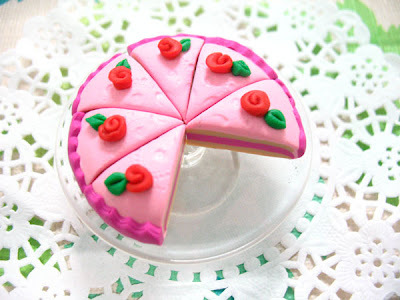 :) I love, love, love the other pieces in that post - especially the intricately detailed hearts with flowers. I'm honored that my little flying hearts are in such good company! 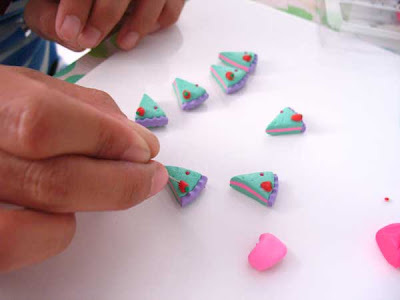 And because today's Valentine's Day, I'd like to share with you these sweet polymer clay treats created by the students of the polymer clay workshop I taught yesterday. We had so much fun! 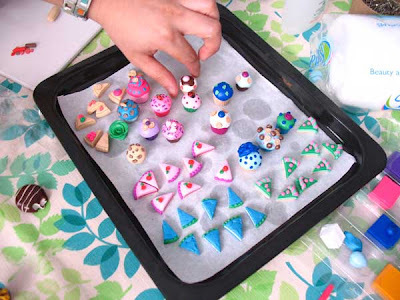 We also made sweet polymer clay-covered heart lockets. I love how these turned out! 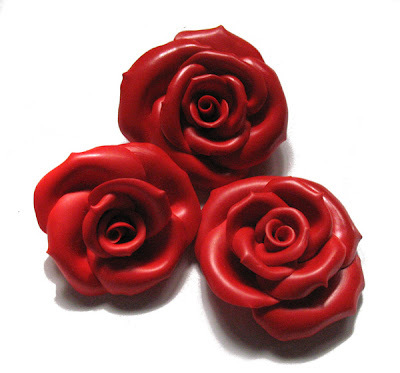 Happy Valentine's Day and Kung Hei Fat Choi (Happy Chinese New Year)! 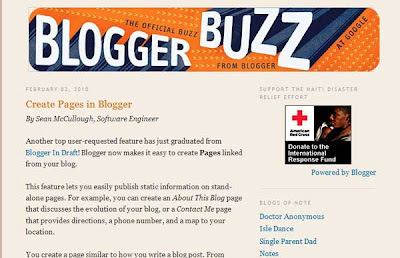 There's a new feature on Blogger! You can now create Pages! It feels a little bit like building your own website. So many possibilities; I'm excited! For more info, read this post on Blogger Buzz. I wish multiply would allow us to do something like that. 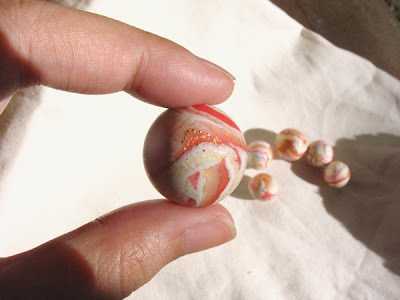 I had so much fun making these gilded polymer clay beads. They're so colorful they're perfect for the coming summer months! No lengthy post today, I'll let the photos do the talking. 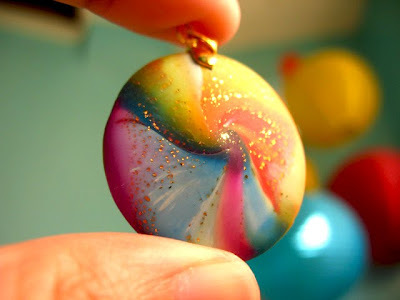 I have pretty much lost my sanity - thanks to polymer clay. 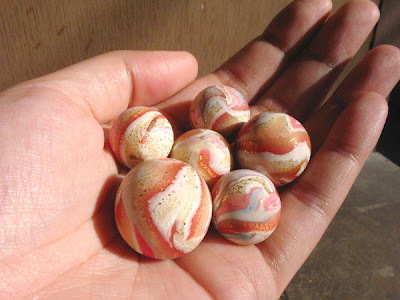 I worked 15 hours straight (finally falling asleep when dawn was breaking) and made a few , er, marbles. I'll turn them into a summer necklace or something. I made other thingamabobs; I posted a few of the photos on flickr. 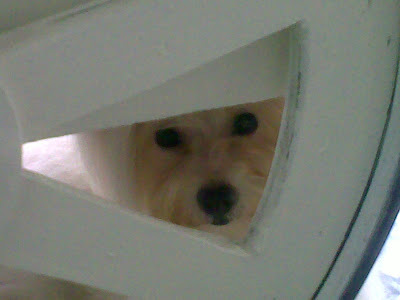 And while I was taking photos of this latest batch, look who came to "help" me out. Lol! I haven't introduced you to these two yet. I will soon, I promise! 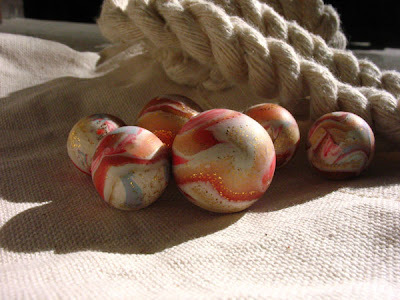 In the meantime, enjoy more photos of my latest polymer clay beads. 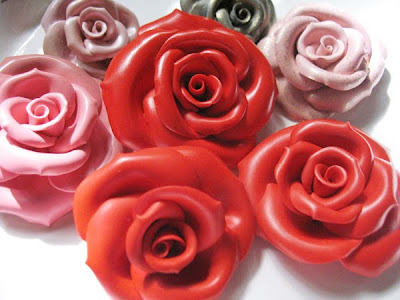 Handmade polymer clay roses to mark the first day of the month of love.